Most of the times, plumbers install backwater valves indoor, but there are some cases when an outdoor install is more practical. Before installing a backwater valve, ask a certified licensed plumber to inspect the drain system of your house and find the best place for it. Installation location impacts its ability to prevent sewer backup, and your ability to maintain the device. In other words, it has to be located at the right place on the main drain and be accessible. There are two types of installation: inside or outside your home. Main advantage of an indoor install is that backwater valve is easily accessible. It is protected from the weather elements. You can visually inspect it, or, in case of spillage, literally smell the malfunction. Indoor install is easier and, therefore, costs you less than outdoor one. Now let’s talk about disadvantages. Both install and cleaning can be very messy. Upon locating the sewer lateral where the backwater valve is to be installed, your plumber needs to jack-hammer concrete basement floor to access it. As a rule, a backwater valve has to be installed either on main sewer pipe or the basement branch line to protect all the fixtures located below grade. Sometimes, the perfect location is hard to access. Other times, locating that place from the first time is difficult, and a plumber needs to jack-hammer more basement floor than originally intended. It’s a messy job. There may be a lot of concrete dust. We pride ourselves in our cleanliness. We cover surfaces, floor, and furniture meticulously. We carry out earth and concrete debris the cleanest way possible. Yet, concrete dust still can make it through the covers. And what if your basement is finished, and you have just invested a hefty amount of money into that floor and walls? Backwater valve install, meant to protect that very environment, will first destroy part of it. A backwater valve must be accessible for maintenance, so part of your floor where it is installed will need incorporate backwater valve lid. This mini-renovation costs money. Then you will have to maintain the device twice a year, and clean it occasionally. This is one of those cases when you should consider installing a backflow valve outside your home. Advantages : No need to destroy your basement floor and incur further renovation costs. Cleaning backwater valve doesn’t result in any smell or spillage in your home. Disadvantages: Depending on where it should be located, you may need to change your landscaping, or it can even be on the driveway. This is because an outdoor backwater valve is buried in the ground. Your plumber is required to install a system which comes to the ground level and provides easy access for cleanup and, potentially, repair. Another disadvantage is cost, which is a bit higher than the cost of an indoor install. However, comparing to the cost of potential basement renovation, or backwater valve’s esthetic impact on the looks of your basement, this extra cost may become an advantage. Note that in the cold climates, burying the device deep in the ground is a good thing. Freezing temperatures won’t impact your backwater valve too badly. However, if you own a bungalow with a crawl space in Manitoba, your plumber may recommend to avoid an outdoor install. This is because your pipes are closer to the ground, and it’s really cold in Manitoba for extended periods of time. In some places, a backwater valve must be installed within your property line, and the property line is too close to your home. In this case, you may not have a choice and need to install indoor. Your plumber should know the city rules to help you do it right. 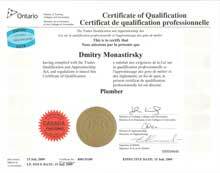 Choose the right type of install, the right plumber, and City of Toronto rebate is guaranteed. You need to meet a number of conditions to get a rebate, and also reduce your home insurance. Your city certified plumber will ensure your back-flow valve is city approved, the installation place is chosen correctly, and all the conditions for the city rebate are met. During the install, plan for a visit of a city inspector. This is one of the conditions of the rebate. Some plumbing companies, ours included, also get a building permit on your behalf, saving you a trip to the City Hall. Then they help you fill out an application and schedule city inspectors. Check out our references on Homestars.com and ask for a quote. We keep our price reasonable and competitive, and our quality very high. Master plumber Dmitry will be happy to answer all your questions and help you choose the best location for your backwater valve.